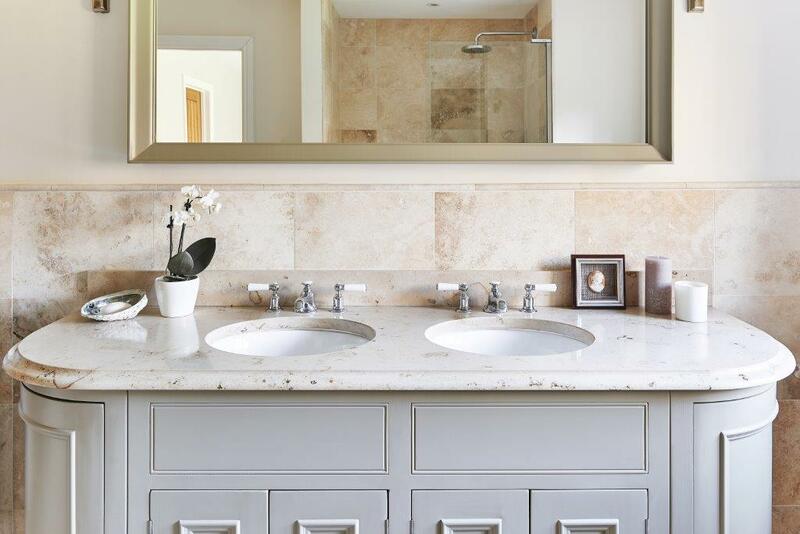 Our worktops often steal the show when it comes to showcasing our impressive projects at Landford Stone and so to start off 2018 we wanted to give our bathrooms a chance in the limelight. On dark winter nights, there’s nothing better appreciated than a touch of bathroom luxury! 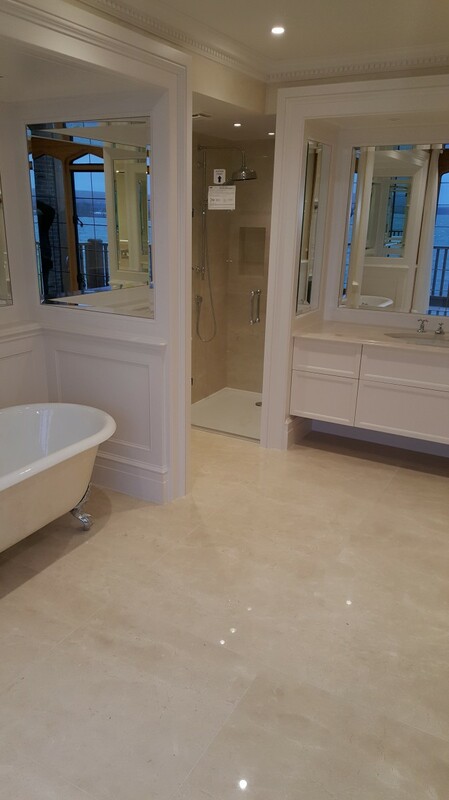 This beautiful bathroom project was installed in Sandbanks, Poole, for a private client. The stone used throughout was Crema Marfil marble (which originates from the Alicante region of Spain). The polished marble floor was painstakingly book-matched. In order to achieve this, each individual tile was cut from the slab in order and then each tile refitted back in the same position so that all the veining in the stone flowed seamlessly. We also fitted wall cladding in the shower and behind the WC as well as 30mm thick vanity tops to match! 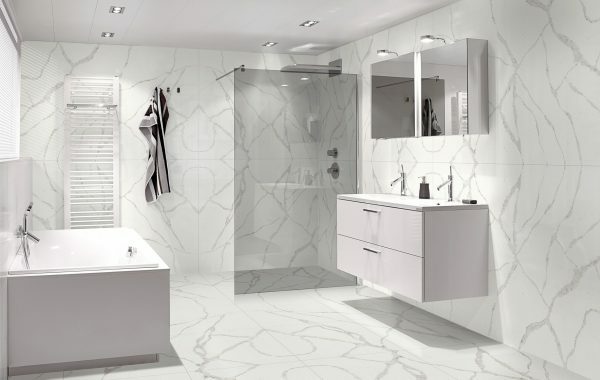 What stone materials can be incorporated into bathrooms? In theory, you can use any material in bathrooms, be it: limestone, marble, granite or engineered quartz. 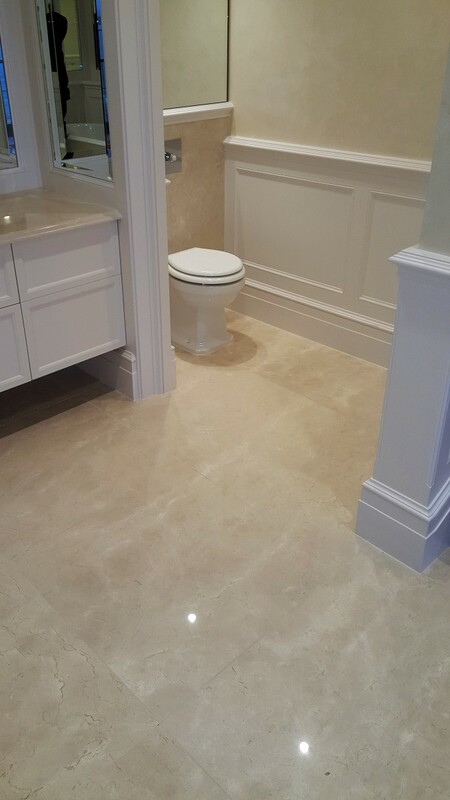 We find that both marble and limestone tend to be the most popular options when it comes to natural materials. 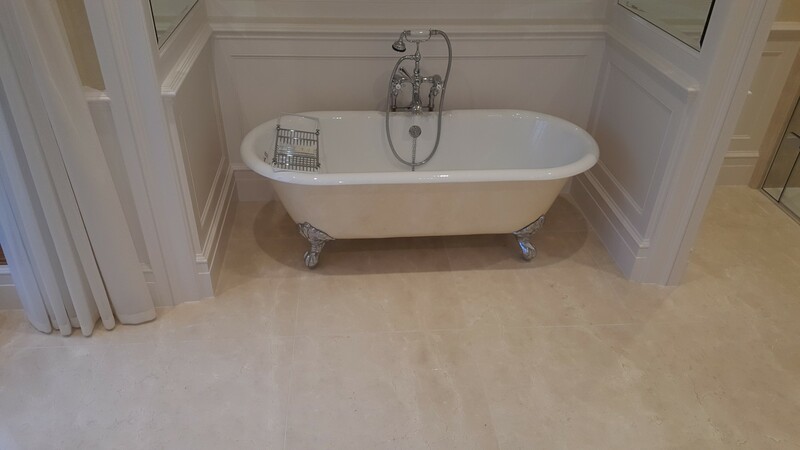 Both marble and limestone look stunning in bathrooms and add a touch of luxury to any project. The only drawback with these materials is that their chemical composition as calcites mean they will react with any acid. Therefore, if you get nail polish remover, cosmetics, shampoos (indeed the vast majority of products these days are acidic to some degree) it is really important to remove it. 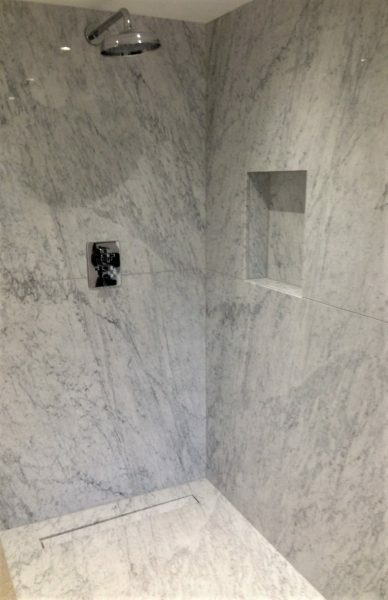 If you are going for either limestone or marble in your bathroom, we would always advise starting with a honed finish. Polished finishes are easily marked and dulled by reaction with acids and so any marks will be more obvious on the eye. Don’t be put off my marble though, it is still a fantastic bathroom material, it just necessitates a bit more thought. In fact, marble has traditionally been used in bathrooms for over thousands of years. The Romans were big marble adopters! Back in 100 BC though, Roman soap was made of tallow and animal fats so they did not share our same issues with acids. 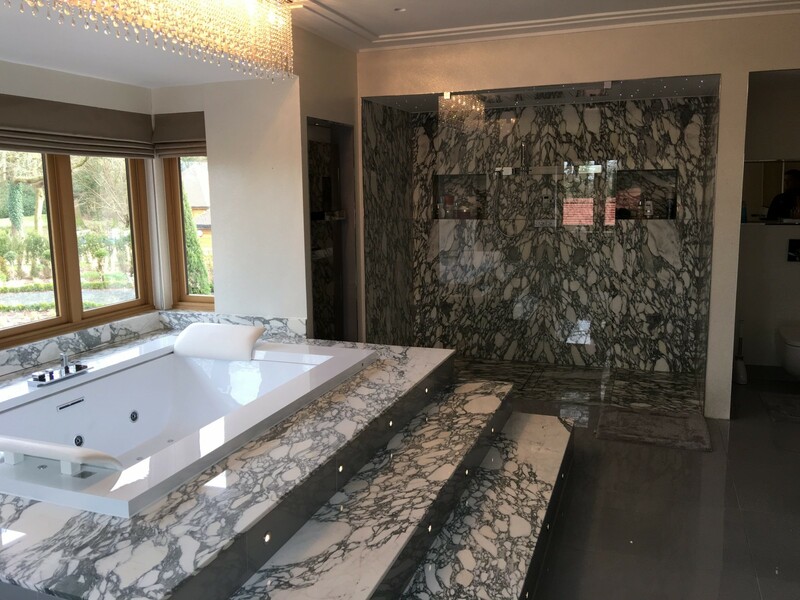 TELTOS Quartz is perfect for use in bathrooms and with our extraordinary array of TELTOS colours, including, wow-factor marble look-alikes, you’re spoilt for choice! The great advantage that TELTOS Quartz has, above marble and limestone, is that you can opt for a polished finish. The high-shine ‘sparkly’ look is a big hit in bathrooms and with TELTOS this is easily achieved! What trends are you seeing in bathrooms at the moment? A new popular feature of bathrooms is slot drains. Instead of the traditional plug and fan drain system, we are now creating more and more ‘slot drains’, where the water just flows down as if its disappears underground. Slot drains look great aesthetically, but don’t come without practicalities to overcome. What we’re recently discovering, as customers opt towards bigger and more powerful shower heads, is that we’re are having to increase the size of our slot drains to match. This also includes the need to plan drainage systems with the increased capacity to cater for larger volumes of water! Nobody wants to shower whilst standing up to their ankles in water! It is so crucial not to overlook the importance of tanking and drainage in any new bathroom. Watch out for our Bathrooms Part 2 Blog, coming in February, where we will be talking ‘tanking’, and explaining why getting expert fitters is worth your while!